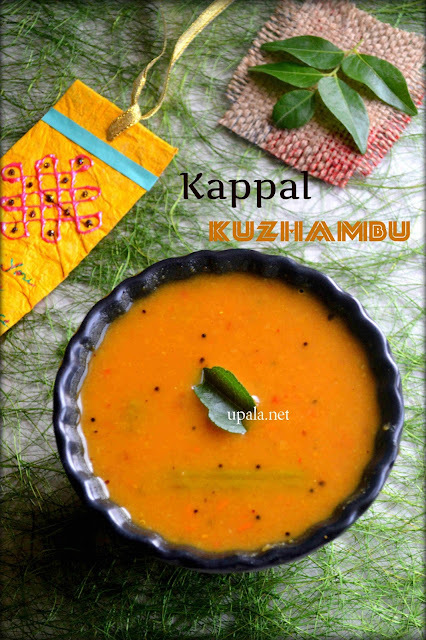 Srivilliputhur special Kappal Kuzhambu is a tasty sambar that can pair up with Rice, Dosa and Idli. Glancing at the title, you will be wondering Srivilliputhur Palgova is famous but "what is this Kappal Kuzhambu?". Even I was wondering the same when "Priya" my neighbour gave me this Kuzhambu, another thing which made me curious was its unique name "Kappal Kuzhambu". It was sounding interesting to me, so I eagerly tasted the kuzhambu. This Kappal Kuzhambu was tasting so yummy that I forgot all those naming conventions and started asking for the recipe. "Do you know that this sambar is made with out toor dal?" She asked me, aaaahhhh I could never realise that. After jotting down the total recipe, she explained me more on this Kuzhambu. 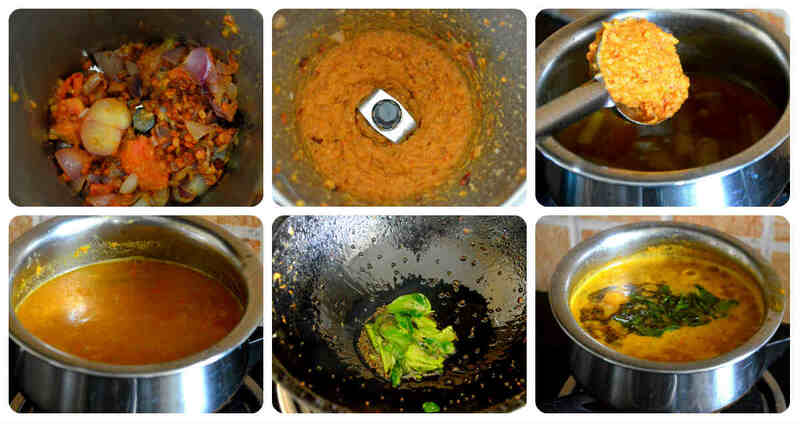 This sambar is a traditional recipe made in most of the houses of Srivilliputhur and the recipe is passed on to generations but don't know why it acquired such a unique name. She even mentioned that this sambar tastes more yummy on the next day as the ground onion will release nice flavour and taste. So, you can make in large quantity and keep it in fridge to use the next day too. 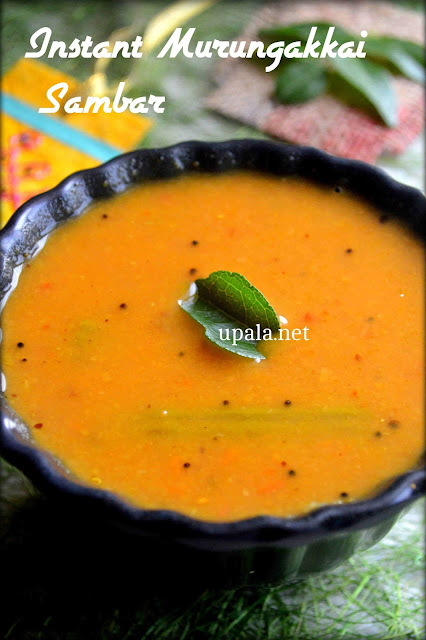 This easy to make and yummy sambar can serve multipurpose of mixing with rice as well as side dish for idli and dosa. Acquiring the name as Nuggekai Sambar in Kannada and Mulakkada sambar in Telugu, it is a fantastic Bachelor recipe too. 1) Soak tamarind in a hot water for half an hour. After half an hour, extract the juice and discard the pulp. 2) Boil the drumsticks in 1 cup of water by adding few salt. After the drumsticks are cooked, switch off the flame and set aside. 3) Add turmeric powder to tamarind juice and leave it to boil in low flame for few minutes. Next, add cooked drumsticks and leave it to boil few minutes in tamarind juice. 4) Meantime, heat oil in a kadai and add channa dal, Urad dal and red chillies. Fry them in medium flame till they turn light brown. 5) Add onions, leave it to fry for few minutes and add tomatoes. 6) Fry till the tomatoes gets cooked then switch off the flame and leave it to cool down. 7) Grind the onion tomato mixture to smooth paste. 8) Add Salt and this paste to boiling tamarind juice, also add 11/2 cups of water to mixer jar to wipe the rest of the mixture and add it to tamarind juice. 9) Leave the sambar to boil till nice aroma arises. 10) Heat oil in a kadai, add mustard seeds to crackle then add curry leaves and fry once. Pour this seasoning mixture on top of the sambar. Yummy Drumstick sambar is ready. 1) You can add 1/2 tsp of jaggery for enhanced taste. 2) Add less tamarind than the regular sambar since we are grinding the tomatoes, it gives more sour taste. 3) If you feel the sambar is thickening while cooking, you can add water to adjust the thickness. 1) Instead of Drumstick, you can use any other traditional veggies like okra, pumpkin, etc. But, I personally loved the Drumstick flavour so sticking to it always:). 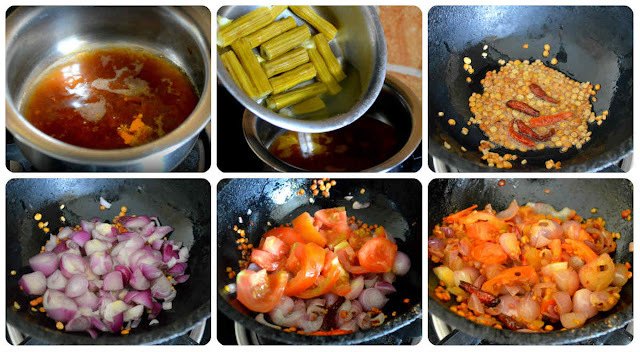 2) I have used Sambar onion for an enhanced taste, if it is not available then you can use the regular ones.